Have you ever visited the CM Almy factory in Pittsfield, Maine? Many NAGA members have, and I hope you’ll have an opportunity to stop in someday. When you do, you’ll see that in addition to making the church metalware offered in Almy catalogs, we also repair and refurbish articles that customers send to us from all over the country. We love this work. It keeps us physically in touch with the magnificent craftsmanship of our forbearers, and inspires our creativity. 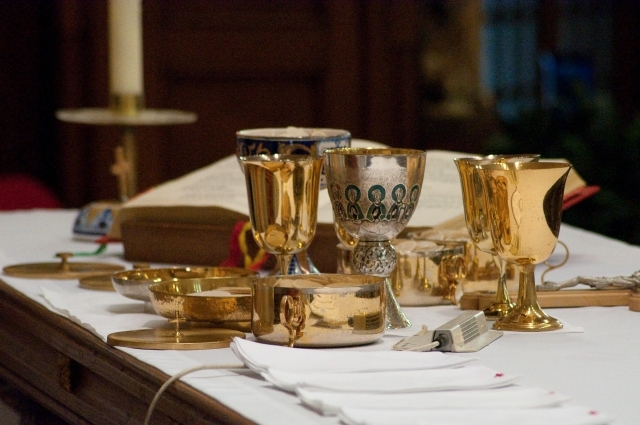 We know how much you value these heirlooms–the warm glow of brass and silver heightens your experience of the liturgy’s holy mystery–and restoring your metalware to its proper splendor is a satisfying way for us to participate in your worship. Unfortunately, having your appointments refurbished means you must do without them for a few days and, of course, there is some expense involved. But here is a secret. A lot of what we do would not have been necessary if the objects had been given better routine care. I am not talking about fixing dents and bends–accidents happen. And electroplate and lacquer coatings do wear thin or deteriorate and have to be professionally restored. Yet that inevitability can be delayed and other damage can be prevented by following some simple suggestions. Caring for church vestments and appointments is time-consuming and there are never enough hours to do everything. Let’s focus on things you can do that save time. Eliminate or minimize wax. Hot wax discolors and degrades the clear lacquer coatings that are applied to most candlesticks to prevent tarnish. Efforts to remove hard wax often cause surface scratches and other damage. Liquid-fueled candles help prevent wax build-up on candlesticks (and linens). Consider liquid candles for torches or candelabra as well. If you have never tried liquid candles, you should: the investment in liquid candles is usually repaid quickly by the lower cost of liquid fuel compared to wax candles. If liquid candles are not an option for your church, I urge you to use followers on all candles. Followers act as dams to prevent dripping and keep melted wax near the flame. This ensures more efficient use of your candles, extends their life and helps keep hardened wax off your candlesticks. Reduce airborne soot and wax that soil appointments. Unseen and unnoticed from day to day, soot from wax candle wicks and oily impurities in the wax itself gradually coat everything in your church’s interior, particularly candlesticks and other nearby appointments. The fiberglass wicks in liquid-fueled candles do not actually burn down so they create no soot, and the liquid fuel is much cleaner than wax. Your appointments will simply be less dirty if you use liquid candles. Don’t let wine rest in metal containers longer than necessary. The acid in wine reacts with metal surfaces to accelerate discoloring tarnish. Even worse, it can cause deep, irreparable pits in the interiors of flagons and cruets. At the conclusion of your service, immediately transfer any remaining wine into glass containers. Wash the interior of the metal vessels with mild soap and water, then rinse and dry with paper towels or a cotton cloth. Wear gloves when you handle metal appointments. Our hands, even when clean, are coated with oils that cause tarnish and degrade lacquered surfaces. Cotton gloves, like those we provide with deliveries of Almy metalware, or rubber gloves for washing, will keep the shine in your appointments for much longer. Of course, this is not practical during the service but it is appropriate at all other times. We wear them in our shop. Gloves will also protect metal surfaces from scratches caused by jewelry. Store tarnish-prone articles in closed bags, perhaps with anti-tarnish strips. Sterling, silver-plate and unlacquered brass articles all tarnish more quickly when exposed to air. Humid or urban environments are especially challenging. Flannel or even self-sealing bags really help. If it’s an article that is not often used, add an anti-tarnish strip. Even if you follow all of our prevention recommendations, you’ll need to clean and polish your metalware from time to time. Here are some helpful hints. To remove melted wax in large build-ups, heat the wax with a hair dryer. When the wax is soft, wipe it off with a paper towel. For the residue and for small buildups, use a liquid candle wax solvent and wipe clean with a soft cotton cloth. Never scrape the wax with a hard object as you risk scratching the surface or damaging the lacquer coating. Wash or Polish? Good question! For many years, metalware makers have applied clear lacquer coatings to brass, and sometimes even to silver articles, to prevent them from tarnishing. Do not use metal polish on articles that have lacquer coatings: the abrasives in polishing compounds scratch and degrade lacquer and do not help with cleaning. You also do not want to use metal polish on gold plate surfaces, such as the linings of chalice cups and ciboria. Gold plate is soft and the coating is thin; polish abrasives will remove it quickly. Gold plate does not tarnish so any discoloration should be cured by washing. If you don’t know whether your articles have been lacquered or gold plated, wash them first and only polish them if that doesn’t produce good results. Washing metalware may be all that is needed. Use warm water, a mild dish soap and a soft cotton or microfiber cloth. Wear rubber gloves. Using small amounts of water, wash the surface, rinse and dry with a cotton towel. Do not immerse church metalware objects; most have closed internal areas that will retain water. Besides sloshing unpleasantly and leaking inconveniently, this water may rust the internal steel rod that holds together many multi-piece church appointments and vessels. Polish metalware that you know is not lacquered, is not gold plate or still looks discolored after washing. Tarnish is the thin brownish-black coating that forms on the surface of brass or silver when it reacts with airborne elements and chemicals such as oxygen or sulfur dioxide. It is not harmful, but it is unattractive. Use the gentlest polishing method you can to restore brilliance to the metal surface. If you adopt a routine of polishing silver and unlacquered brass frequently, all you’ll need is a specially treated polishing cloth, available at houseware stores or from Almy. These are cotton flannel cloths that are infused with compounds that remove the very thinnest layer of surface material and do not harm underlying silver plate coatings. If a moderate coating of tarnish builds up on your article, apply a light silver polish (usually white in color) with a sponge or cotton cloth. If your item is heavily tarnished, almost black, use a more heavy-duty brass polish (usually pink in color). The more coarse abrasive in this polish will help you complete tough jobs quickly. When you have removed the tarnish, remove visible polish residue and buff with a clean cotton cloth. A cotton swab or toothpick will help in decorated areas of your appointment. When you are finished, a thin layer of wax will be left that will slow the next onset of tarnish. What if nothing seems to work? You have washed and polished, and your metal appointment is still dull and discolored. In our experience, this may be because the lacquer coating on a piece has degraded. Small cracks in the lacquer have allowed tarnish to form and spread in the underlying metal, but enough lacquer remains to make washing or hand polishing ineffective. It’s time for professional refurbishing such as we offer and, of course, we’ll be happy to help. For this and many of the care and cleaning supplies mentioned, please call 1-800-225-2569, click on www.almy.com or visit us in Old Greenwich, Connecticut, or Pittsfield, Maine.